Non-Clinical Physician Jobs, Careers, and Opportunities: LAST CHANCE to Submit Abstracts for the MD/MBA Conference!! 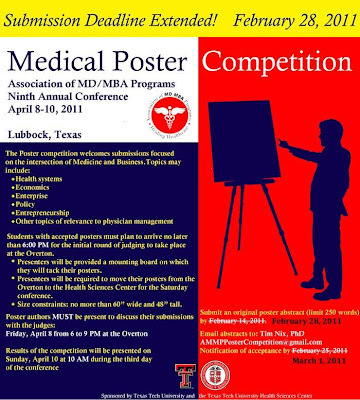 LAST CHANCE to Submit Abstracts for the MD/MBA Conference!! We are getting really excited for the 9th annual MD/MBA Conference hosted by Texas Tech University in Lubbock, Texas! If you haven't submitted an abstract for the poster competition, the deadline has been extended to February 28, so get your submissions in to AMMPPosterCompetition@gmail.com! We are looking for any posters focused on the intersection of medicine and business, including health systems, economics, policy, entrepreneurship, physician management, health IT, and more. For more information about the poster competition, go to the website or click the flyer image below. The conference will be held April 8-10, 2011. Register here! It will be a great opportunity to learn about career opportunities and network with MD/MBA students and notable physician executives. We will also be hosting the first annual AMMP Residency Fair!